In June 2012, Scenic Hudson protected 76 acres in New Baltimore with magnificent views and more than a quarter mile of natural Hudson Riverfront. The protected property features nearly 1,400 feet of natural shoreline.Robert Rodriguez, Jr.
Scenic Hudson partnered with the New Baltimore Conservancy to conserve this ecologically diverse landscape featuring rocky bluffs, forest, rolling meadows and 1,370 feet of natural Hudson Riverfront. The property affords magnificent vistas—extending to the Berkshires and encompassing sweeping river views—which, combined with the land’s proximity to Albany, made it highly desirable for residential development. 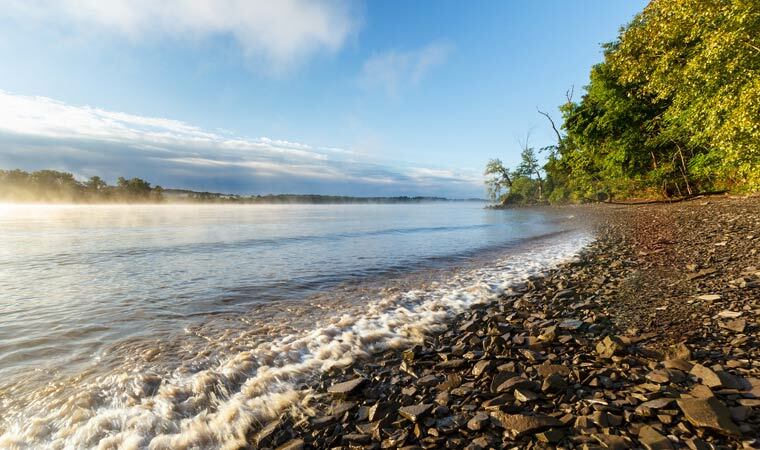 The property also is prominently visible from two popular natural areas: Schodack Island State Park and The Nature Conservancy’s Lewis A. Swyer Preserve. A path traversing this historic farm runs downhill to the level, open shoreline, making the property ideally suited for passive recreation, including hiking, kayaking, bird watching, and cross-country skiing and snowshoeing. Scenic Hudson is working with the New Baltimore Conservancy and other community partners to determine specific plans for public access and use. The conservancy is committed to making necessary improvements and managing the eventual park. The acquisition is part of Scenic Hudson’s collaborative campaign to Save the Land That Matters Most, protecting 65,000 acres of great scenic, ecological and agricultural significance.